First there is a Chief Dodge, then there is no Chief Dodge, then there is — details are few, but we’ve got ‘em in this week’s issue, along with other news from the Montague selectboard. 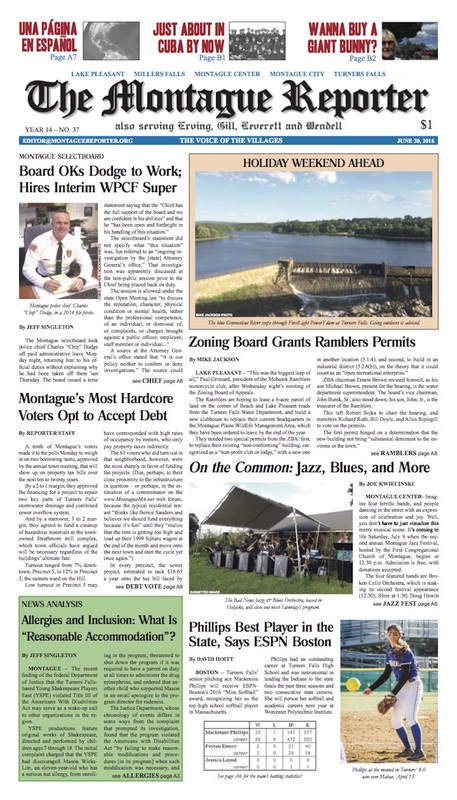 Also in Montague: voters accept debt; Ramblers get permits; TFHS pitcher named best in state; the fourth annual Jazz Festival beckons; and a complaint against a youth theater group raises questions of allergies and accommodations. In the towns: Gill says yes to backhoe and cruiser purchases but no thanks to fire regionalization study. Leverett moves toward green electricity; Erving adopts a “stretch code” and grapples with technology issues. Our editorial analyzes the causes and implications of Brexit, and our monthly Spanish language page, Aquí se habla español, discusses recent developments in immigration policy, gun control, and Trumpetry. MoRe: For serial lovers, Part Two of On Thoreau’s Trail and Part VIII of Turners Falls Goes to War. 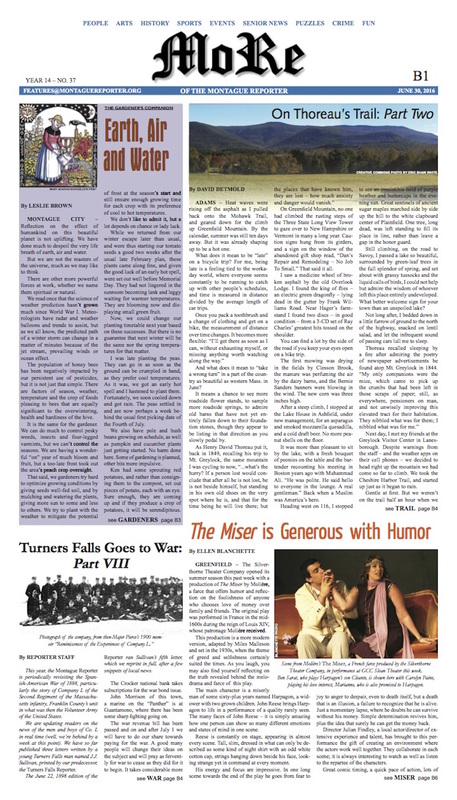 The Gardener’s Companion weighs nature and nurture; Molière at GCC; our Farmer’s Market correspondent hears tell of a large, lusty rabbit in Gill; learn all about fainting with the Healthy Geezer; get to know the YMCA; and pick from the many arts and entertainment listings to fill your calendar. Looking to blow end-of-fiscal year money? Subscribe today!